Unlike most rodents, guinea pigs -- also called cavies because of their scientific name, Cavia porcellus -- do see colors. They are not color-blind; they see most colors accurately. They also rely on their other senses, such as hearing and touch, which are more developed. According to Leatrice Eiseman, head of the Eiseman Center for Color Information and Training, guinea pigs -- along with horses and sheep -- have better color vision than cats, dogs and most other animals. To test guinea pig color vision, scientists put a piece of food such as lettuce -- one that isn't likely to be found by smell -- in the same colored bowl time after time so the guinea pig comes to associate the food with the color of bowl. He will seek that bowl each time, even when the bowls are rearranged. Their poor depth perception gives guinea pigs the reputation of not seeing well. Actually, guinea pigs can see 33 images per second -- humans see only 22 -- and they have a 340 degree range of vision. 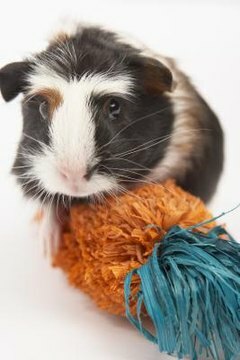 Tactile hairs on guinea pigs' muzzles help them find their way in the dark as well as figure out how large an opening is. They also hear better than humans and have a highly developed sense of smell.